First published on August 5, 2013. I first got interested in the question of autographs as trademarks in connection with the case I first wrote about here involving Jimi Hendrix’s scribble. A follow-up post can be found here. Later on I got my two cents in with respect to a case involving the signature of pop singer Taylor Swift. 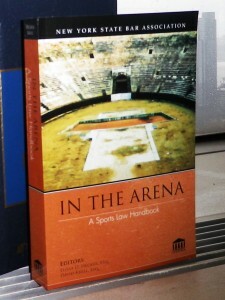 When I was asked, then, to contribute to the new New York State Bar Association publication, In the Arena: A Sports Law Handbook, I revisited the autograph issue in some more depth. This post is adapted from my chapter in that book so, surprisingly, it sounds a little bit less like a LIKELIHOOD OF CONFUSION® post and a little bit more like, you know, a book. The Hanna Manufacturing case lays out the facts underlying the court’s premise that the signatures of the ballplayers implicated were entitled to trademark protection; namely, that the appellee used the autographs on products endorsed by the players. As usual, California is different, and more protective of rights emanating from “persona.” Cal. Civil Code § 1739.7 forbids sports memorabilia dealers from representing an item “as a collectible if it was not autographed by the sports personality in his or her own hand” and requires dealers to provide prescribed certificates of authenticity with their signed collectibles. The questions surrounding authenticity of autographs and autographed memorabilia raise issues related to the topic of this chapter but ultimately sound more precisely in consumer protection, even when couched in terms of unfair competition. See Upper Deck Authenticated, Ltd. v. CPG Direct, 971 F. Supp. 1337, 1348 (S.D. Cal. 1997) (arising from dispute over rights to sell autographed memorabilia did not state an infringement claim under the Lanham Act absent proof that the plaintiff was the exclusive licensee of endorsing athletes but could maintain a false advertising claim under the statute upon proof of “commercial injury based upon a misrepresentation about a product, and also that the injury was ‘competitive,’ i.e., harmful to the plaintiff’s ability to compete with the defendant”). In contrast, in Ryan v. Volpone Stamp Co., Inc., 107 F. Supp. 2d 369, 386 (S.D.N.Y. 2000), a claim against a licensor who continued the sale of merchandise endorsed by Hall of Fame pitcher Nolan Ryan after the termination of a license agreement was found to have stated a claim for trademark infringement. Unfortunately, the opinion in Ryan is vague about precisely which components of the rights covered by the license agreement were actually deemed to be trademarks and on what basis. In fact, although the term is used throughout the opinion, the amended complaint did not contain the word “trademark” and only pled false designation of origin under § 43(a) of the Lanham Act. 2000 WL 35483078 (S.D.N.Y. Sept. 13, 2000) (Trial Pleading). As the Court has previously held, the Jimi Hendrix name has a secondary meaning. Plaintiffs’ Jimi Hendrix signature mark consists of the Jimi Hendrix name written in script on one line with a more prominent uppercase J and uppercase H to begin each name. The Court holds that the arbitrary nature of this mark’s features, such as text placement and the use of script lettering make this mark a strong mark even apart from the strength of the secondary meaning associated with JIMI HENDRIX as well. This novel holding suggests that what is by all indications an obscure signature of a famous person may be protectable as a trademark, based not on its use as such, but as a subsidiary of the fame of the (non-endorsing) celebrity him- or herself and at least a token finding that the autograph has supposedly unique calligraphic qualities. Pirone v. MacMillan, 894 F.2d at 583 (2d Cir. 1990). In some cases, evidently, the famous—even the dead—are indeed different from everyone else.